We have got the best ski equipment for you! With INTERSPORT equipment, you always have the best possible products available. Choose from a big choice of ski and snowboard models as well as the latest ski boots. You can find us in all top destinations in Switzerland - also in your favourite skiing area! Es war ein super freundliche Beratung vor Ort, besonders der Umgang mit den Kindern war sehr lobenswert. Vielen dank!!! Ich habe aus Versehen ein Snowboard gemietet aber ohne Probleme dann Ski bekommen, super. Sehr guter und freundlicher vorab Kontakt zur Reservierung und Bereitstellung des gewünschten Leihmaterials. The staff were super helpful and friendly. The skis and boots were well prepared and in good condition. I was recommended to try wider skis and this was a really good choice for the conditions, since there was a lot of new snow. Thanks for your excellent service! I was incredibly impressed with intersport Julian ! The service and professionalism your staff exhibited was nothing short of SPECTACULAR! My family has varying skill levels and your staff promptly addressed each members needs and provided recommendations on how to best start out on Zermatt. Your efficient staff had us in and out in 15 mins and the return process took even less time ! Enjoyed the small talk with the sales person. Great personalized service. No wait time. Thank you. Wir kommen im 2020 wieder (falls nichts dazwischen kommt). Wir schätzen es sehr, dass ihr ein Skidepot anbietet, dass erleichtert vieles, vor allem, wenn man nicht mehr ganz jung ist. Weiter so! Everyone at CentralSport is great and always helps or ski holiday go smoothly, but big thanks to Steve and Colin who were awesome as always. Big thanks also to Waldo who was fantastic in his help with my purchase and subsequent alterations of my first pair of ski boots. Top quality service all round!!! Beratung und Bedienung ist offen und professionell. Es macht spass bei Intersportrent Skiers zu mieten, vorallem wenn die jederzeit Möglichkeit besteht, den Ski zu wechseln wenn es nicht passt. Thank you so much for the help and making my trip to Switzerland an unforgettable one! Helpful, friendly staff who made us feel welcomed. My daughter had to change her boots and it was no problem and done very quickly. I booked online for a rental starting the next day, however we headed to the shop the same day near closing time and the shop was very accomodating in getting us sorted out then and there - even without the reservation having come through to their end of the system! Lovely, helpful people - no request (or change of mind) was too much for them. The shop was extreamely accomidating. I will dffinetly use them again to rent for my family. It’s so easy to book our ski equipment with Intersport and the quality is always high, why would we want to hire from anywhere else! Ich war immer sehr zufrieden mit allem von Intersport. Aber dieses Jahr war alles noch besser, wirklich top. Beispiel: Der junge Mann im Skidepot in Saas Fee war mit seiner Freundlichkeit und Bedienung Spitze. Weiter so. Vielen Dank. Sehr nett... alles prima gelaufen! The service was impeccable and above expectations. This is how all rental shops should operate! I would highly recommend them. The staff was incredibly helpful with the equipment and giving us general information and tips about Grindelwald. I was very happy with the quality of the equipment and check-in and check-out were a breeze. Would definitely use Intersport again/recommend to a friend. Ich habe immer wieder Spass die Skiausrüstung über den Intersport zu mieten. Gute Erfahrung in der Vergangenheit gemacht. Somit: "Wiederholungstäter"
Congratulations for having Mathieu in your team! Great help! Sehr nette Atmosphäre, top-Servive, insbesondere auch der Liefer- und Abholservice zu unserem Hotel in Pontresina. Alles sehr entspannt und professionell. Online Buchung sehr einfach, super Beratung vor Ort. Seit einigen Jahren leihen wir unsere Ski-Ausrüstung bei Intersport. Wir sind immer gut bedient worden und rundum zufrieden. Quick and easy ski rental at INTERSPORT Rent! Get the best ski equipment today. available for you in all Top Destinations in Switzerland. 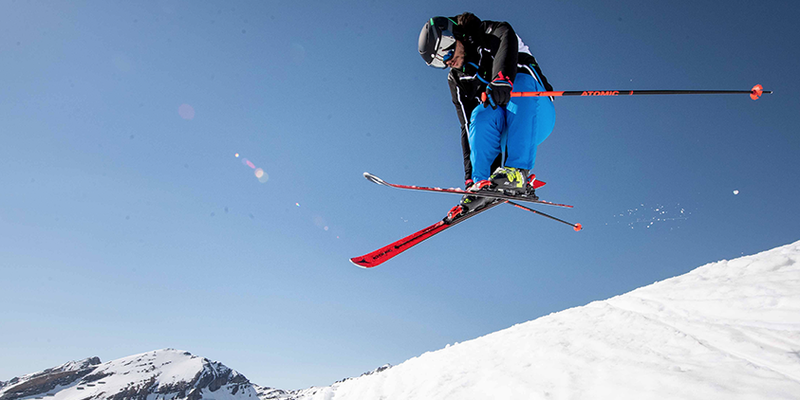 The fastest way to book your skiing equipment online. The best reviews for the best service. No more data input, we remember your used equipment and you'll get all important information for your perfect skiing holidays.